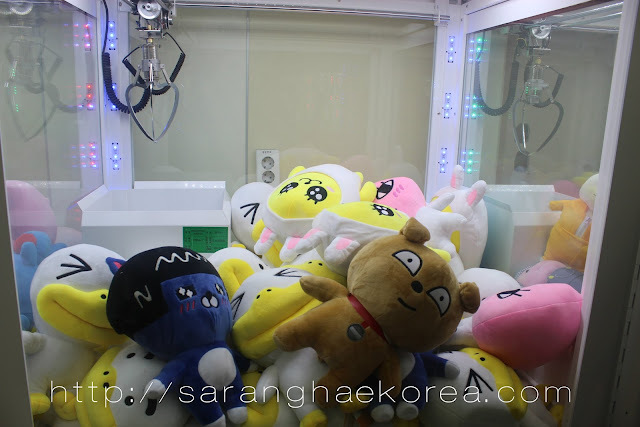 Four years ago, prize claw machines already existed in South Korea. They were everywhere, but you can just see them in some random corners especially in the market places. However, these days, prize claw machines have elevated into a higher new level, they’re no longer rusting in some lonely corners of the street; but instead, you can now see them in an arcade room especially dedicated for them. I admit I tried playing in a prize claw machines for several times, in all those instances, I don’t remember winning even once, I therefore concluded that these arcade games were rigged. You sure could just buy a $5 worth of stuff toy in the market. It’s just that, people are looking for the thrill, and the joy they got from playing in this machine is simply priceless. The prizes are simply generic plush toys manufactured by who knows who, but they’re cute and fluffy enough to gain customer’s attention. But before you all get too excited and enlivened over this new craze in Korea that is인형 뽑기, I will explain first what it is all about. Well, for a start, it’s simply an arcade game also known as claw machines. You can find this kind of machine almost everywhere in Korea. Prizes at stake varies, it could be jewelries, dolls, toys, but in the case of 인형 뽑기, the prize is usually plush toys. The mechanics of the game is simple, you just need to insert the money in the slot to turn on the machine. The cost per game ranges from 500 won up to 1000 won, this will give you 15 to 30 seconds to get the prize you want by manipulating the crane using a joystick. That’s it, simple and fun. 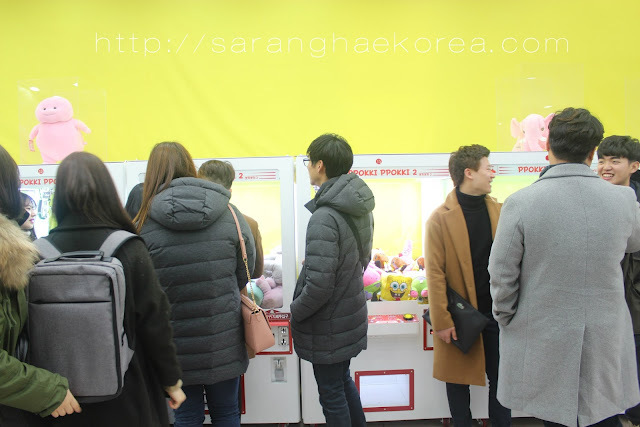 Nowadays, if you walk along the crowd of Koreans in some random market places, chances are, you’ll get to see young people and young Korean couples holding some generic plush toys. I think, there’s 80 percent possibility that they got it from the claw machines. There are a lot of reasons why Koreans are hooked into these machines, based on my personal analysis and psychoanalysis, Korean guys used these machines to impress their girlfriends. They are willing to spend several Cheon Won because their girlfriends are cheering for them. Also, it’s a way for a group of friends to bond and cheer for each others. And most of all, it’s thrilling and entertaining. As I’ve said, you can just buy those toys from some novelty shops, but the joy of getting it from the claw machines is different. No wonder why Koreans flock to places where there are claw machines installed. 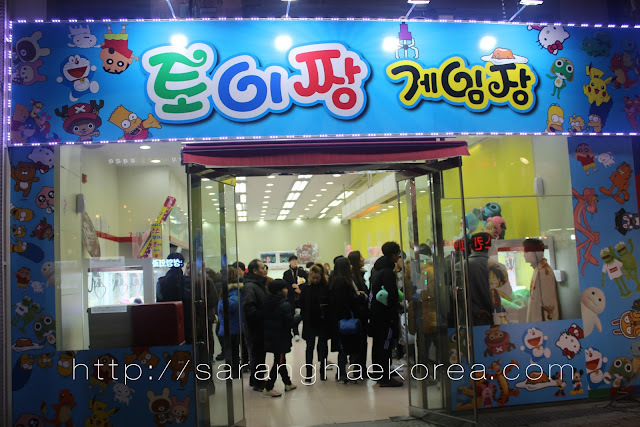 Arcade room for claw machines are sprouting like mushrooms everywhere in Korea nowadays. I thought it’s only happening in Seoul and in Cheonan, but when I went to Daegu last New Year, I couldn’t believe they closed some fashion retail shops and jewelry shops to convert it into an arcade room for claw machines. I thought it was crazy idea, but people are actually patronizing this business. So if you have spare coins and wondering how you can dispose that off, head on now to your nearest인형 뽑기and get them all plush toys.